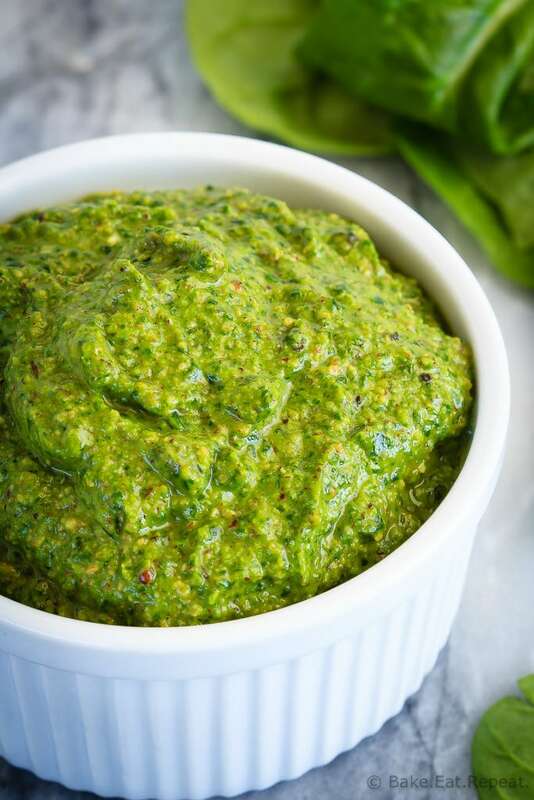 This spinach pesto is so quick and easy to make, you’ll wonder why you ever bought pesto! It’s the perfect, flavourful addition in so many recipes! Plus a quick recipe video! Do you love pesto? Add it to anything and everything? Or hate it? I’m starting to really love it. I’ve been making a pesto pasta recipe with it incessantly lately, and I’m kind of loving the fact that the kids think it’s the best meal ever. And these are the same children that refuse to eat spinach. For the most part my kids aren’t too picky, but they won’t eat spinach. Unless it’s sneakily hidden in a pesto pasta sauce that is (or smoothies, they’ll usually drink those). We’ll see how long I can keep up that deception by just calling it green sauce. 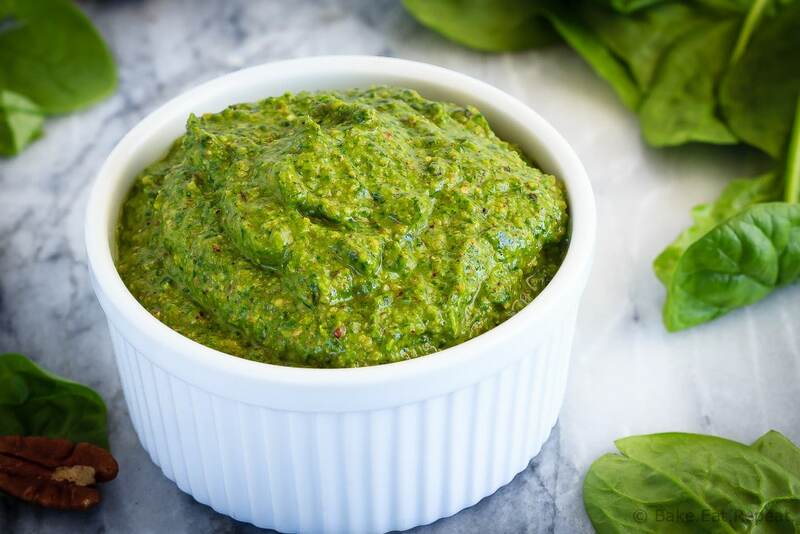 This spinach pesto is my new favourite recipe because it is so quick and easy to make, but also because I am completely incapable of growing basil (which is the usual green stuff in pesto). For some reason it will never grow for me, even when I buy the plants that are well started instead of just planting seeds. It still dies. I don’t know what I’m doing wrong – isn’t basil supposed to be one of those plants that is easy to grow? But then, I can’t grow zucchini either, which is completely baffling. It’s only the most prolific plant ever – except in my garden. In my garden it inexplicably dies. Every. Single. Year. At any rate, I can’t grow basil, so I’m definitely not harvesting boatloads of the stuff to make pesto with. So I made spinach pesto – because I love spinach, I can grow spinach, and spinach is always available at the store. And evidently, spinach pesto is one way to get the green stuff into my children without any tears. Preheat the oven to 350 degrees F. Spread the pecans on a baking sheet and toast for 5-10 minutes until fragrant. Let cool. In the bowl of a food processor, combine the spinach, pecans, parmesan, garlic, salt, pepper, lemon juice and zest, and 2 tablespoons of the olive oil. Pulse a few times to combine everything. With the processor running, drizzle in the remaining 4 tablespoons of olive oil until the pesto is well combined. Use immediately or portion it into an ice cube tray to freeze to use later. Once it’s frozen you can pop out the pesto cubes and store them in a ziplock bag in the freezer until you’re ready to use them, up to 3 months. This pesto sounds great. I really need to make my own more often! Oooh, yum! This looks so refreshing. 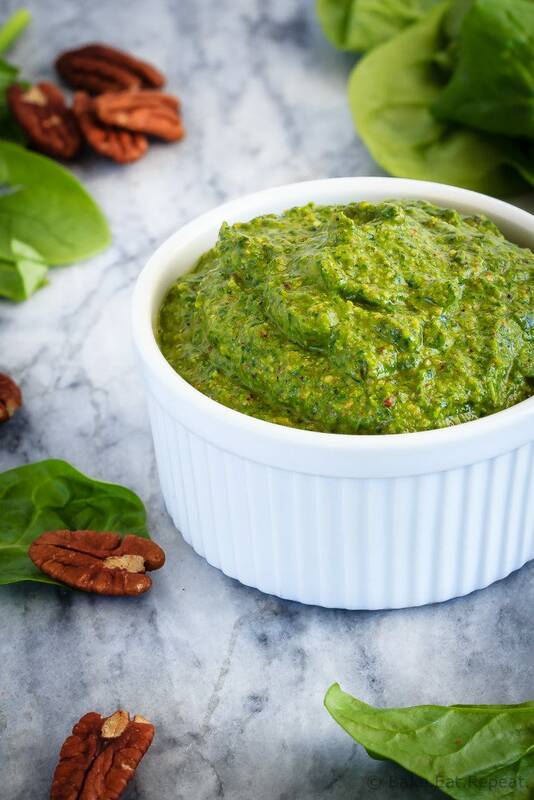 I love pesto, but always substitute in walnuts for pine nuts! I'm glad you do, too. Thanks for sharing. This pesto is gorgeous, Stacy! I can't really grow much either but for some reason my basil plant is the one that usually grows best so I am a huge pesto lover and making it with spinach sounds fantastic! Haha, well I think basil IS supposed to be easy to grow! I just can't for whatever reason. :) Thanks Kelly! Haha, I can't grow much of anything at all! I'm a big lover of pesto, but I'm up for all kinds of varities!